This post has been published by me as a part of the Blog-a-Ton 10; the tenth edition of the online marathon of Bloggers; where we decide and we write. To be part of the next edition, visit and start following Blog-a-Ton. As I escaped from becoming a Fool last time, I decided to compensate for it by Escaping twice this time. So here is my second entry for Blog-a-Ton 10. This is another ACROSTIC from my stable after my recent attempt, Religion. Though, this poem is pretty amateurish but was pretty difficult to write as here, rather than the first letter, the first words of each line form a message. 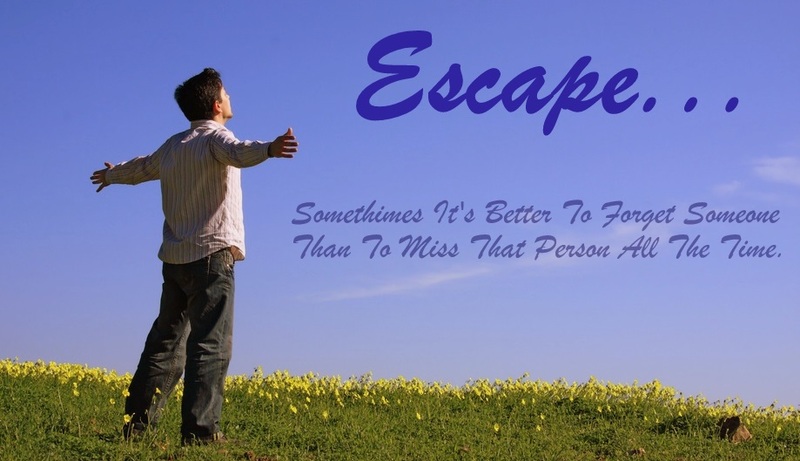 So do not miss the message in red which is how I define Escape in this post. To know more about Acrostic and read my previous attempt, click here. Marshall hoke bhi itna nahi jaante? What a beautiful way to present the thoughts! Simply loved it...moreover the post is enchanting! Well Mahesh, it simply talks about failed love and how the brain is now telling him/her to let go!! So this is what you're telling me as in answer to my escape poem? Yes, forget the past, set priorities right, and I agree with you! Just as good as your first one. Infact, I like this a little better! Hi Vipul, I have been reading your work for quite sometime now. Could I tempt you into considering a submission for a baby e-magazine called the survivor chronicles?The details can be found here. Nice poem. You managed the rhyme and ACROSTIC well without seeming deliberate and loosing track of meaning. Thnx for appreciating this form of poetry! Very nice.Somehow I never became a part of this. Superb way of expression!! Loved the post!! That's a nice expression. Liked the vertical and horizontal expression through words!! All the best for BAT-10! this is great! and i totally agree with the message spelt out in red. and i didn't find it amateurish as such..
thnx 4 sharing ur views and um happy u liked it.. keep reflecting! Hey that was a very nice successful attempt. Liked the meaning and thoughts in each line. A escape that everyone need at some or the other point of time in their lives. And hey you suffer from ACDS? Will be visiting you again..
Nice poetry. Yeah the message is pretty clear. Acrostic poems are quite interesting.